Let’s Sing It Again Mommy! How many times have you listened to the “Hello Song”, “They Come Back”, or “John the Rabbit”? My kids are obsessed with “She Sells Sea Shells”, and I have probably sung it over 100 times this semester. As a parent and a teacher I often burn out on the songs. It is important to remember that children learn from repetition. Think back to middle and high school. How many times did you listen to that special love song? I know I had a few mixed tapes that I listened to over and over again. It was necessary for me to do this in order to learn the words and the tunes. This is exactly what our children are doing through this repetition – they are learning basic music skills. They are making connections with words, tonalities, rhythms, emotions, and experiences. Try singing without the recording. Look at the song through your child’s eye. What do you think draws them to it? Try to focus on that. Use movements and activities from class at home. Use your songbook. 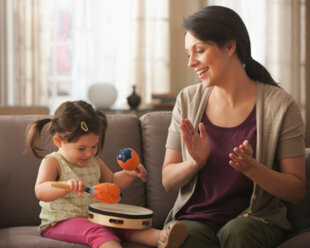 Under each song are more ideas and activities to try at home. Music Together has created books that go along with the “Hello Song” and “She Sells Sea Shells”. My children adore these books and we use them all the time. My daughter and I colored our own pictures of seashells. We made our own orchestra with kitchen items. We play the game “Roll Over” with stuffed animals. We all have different ways of responding to our children’s same song requests over and over and over again. What has worked for you? Do you keep the song on repeat? What things have you done to keep that particular song fresh? I would love to hear your ideas in our comments.